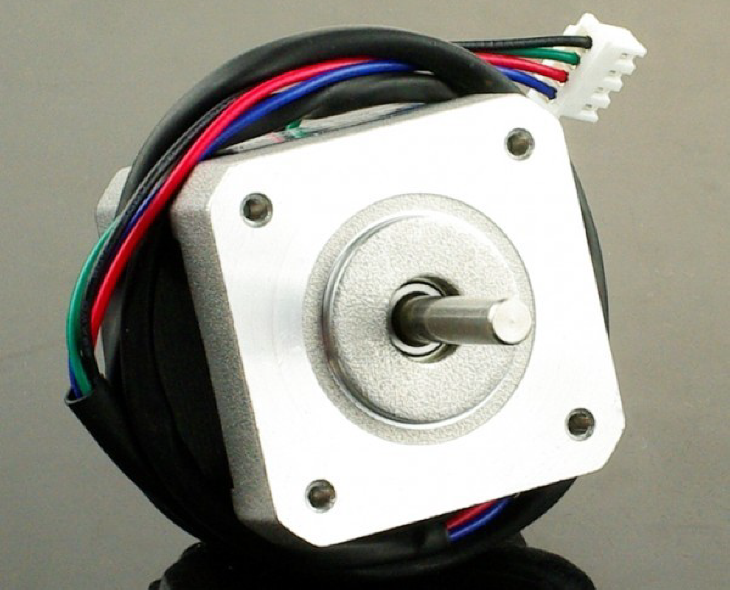 Stepper motors are an important part of 3D printers. They are used in a variety of applications depending on the type of printer. For example, stepper motors are used to move the extruder or the build platform along the x,y, and z axis. The extruder assembly also has a stepper motor used to pull the filament into the extruder. Stepper motors are unique in that they can move to a known interval and then hold that position. Because they are a good motor to move an object to a repeatable position, they are often used in robotics and in printers. Stepper motors come in a variety of sizes. The most popular sizes used in 3D printers are NEMA 14, NEMA 17 and NEMA 23 and NEMA 24. NEMA is a measurement standardized by the National Electrical Manufacturers Association (NEMA) and refers to the frame size of the motor. Just because a motor has a larger frame doesn’t mean it has more torque. If you are building your own 3D printer, www.reprap.org/wiki/Stepper_moto has a purchasing guide to help you determine which stepper motors will work the best for the 3D printer you are building.